Once you have your Slack channel all set up, the next step is to install some integrations. But what are they and which are the best Slack integrations? We investigated so you don’t have to! Recently I showed you what Slack was and how you can use it to simplify communications, especially if you are part of a remote office. 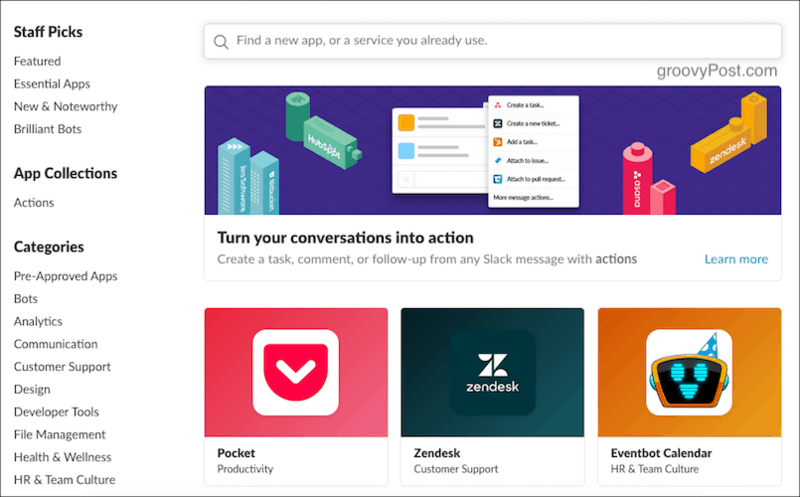 I mentioned at the end that you can make Slack even better with “integrations” (also known as apps). So here are what I consider to be the ten best Slack integrations. Slack maintains an app directory with all of the officially approved integrations, and on a free account, you are restricted to a maximum of ten integrations. But on paid plans, that restriction is removed and you can go integration-crazy. Choose the right ones and you can have a productivity powerhouse in your Slack channels. What Is a Slack “Integration”? In Slack terms, an integration is similar to a browser extension or plugin. In other words, it provides the app with a feature which doesn’t come already prepackaged with the service. You click to “install” the extension to your Slack account, and then authorize the extension to connect to the third-party service (if applicable). For example, for the Twitter integration, you will have to authorize it to access your Twitter account. The Dropbox integration needs access to your Dropbox account, and so on. The vast majority of integrations are free but I have seen the occasional few that cost something. There are so many integrations, but if I was starting a new Slack channel, these are the ones I would immediately install, by default. You can manage your existing integrations (including uninstalling unneeded ones) here. You may be using Slack to get away from your email inbox, but obviously, there are some email notifications you just can’t miss. 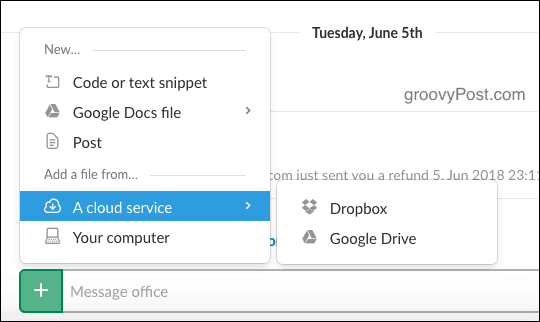 In that instance, you can use the email integration to have select emails forwarded to Slack. For example, in my private Office channel, I have all notifications from Paypal sent to me. So whenever someone pays me or refunds me, I get a ping from Slack. Clicking on the notification will open up a copy of the email contents. I would probably burn my Slack channel to the ground if every single tweet came rushing into my channel. That’s why with the Twitter integration, you can specify it only to alert you when your username is mentioned. This has helped me to stay on top of Twitter conversations and reply to them in a timely fashion. It also means you don’t have to visit the Twitter site as much, just to see if you have any mentions and replies. Cloud storage is now an extremely common practice among online users. So it makes logical sense that the top two players in the game, Dropbox and Google Drive, will want to get in on the Slack action. Using this integration, you can upload files to Slack from your accounts as well as share access to folders on your accounts. Slack also has an integration for Microsoft OneDrive if you are more of a Microsoft fan. Also, one for Box. When it comes to curated links and shareable stories, nothing beats Digg. It is just a monster. Now you can have that monster send you the best of the best straight to your Slack channel. 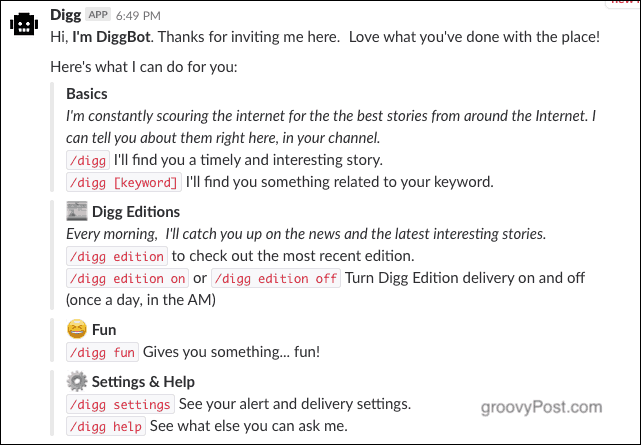 Once it is installed, it gives you a list of commands that you can give to the Diggbot. Then it will send you stories, the latest edition of links, and much more. Be warned though, this is not a productivity integration. More like a “falling down the rabbit hole” integration. For people who are visual (and I’m one of them), Trello is a godsend for organizing work and time management. It allows you to create cards showing your tasks, and then you can drag them around with your mouse. Naturally, Trello now has a Slack integration. I haven’t made full use of it yet but every Slack person I speak to swears by the Trello integration. 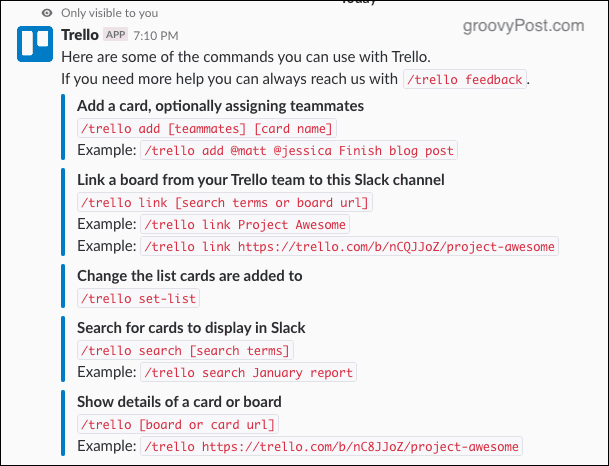 However, you have to link only one Trello board to your Slack channel, so Slack knows where to send everything you tell it. This is actually a rather sneaky way of getting around the maximum 10 integrations, if you’re on the free plan. Simply install the IFTTT integration and do all your automation from there. 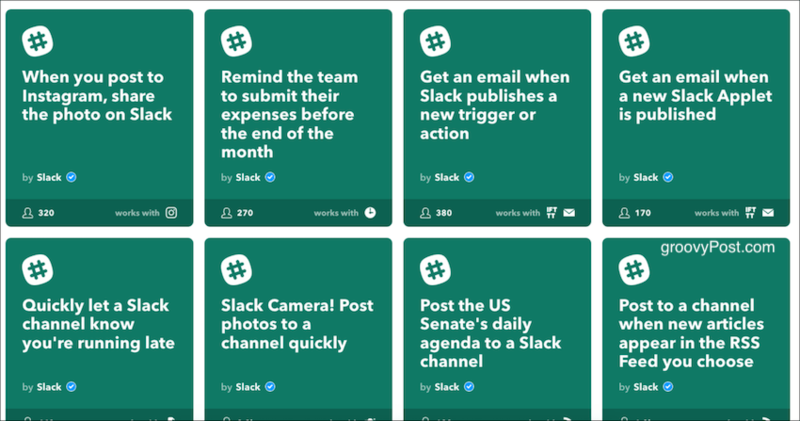 IFTTT has so many automation possibilities that you can send to Slack, that it is positively dizzying. What’s great about IFTTT is that if the automation recipe you want is not there, you can create it yourself! On a similar note, Slack also has an integration for Zapier. For all you entrepreneurs and capitalists out there, the credit card processor Stripe also has a Slack presence. 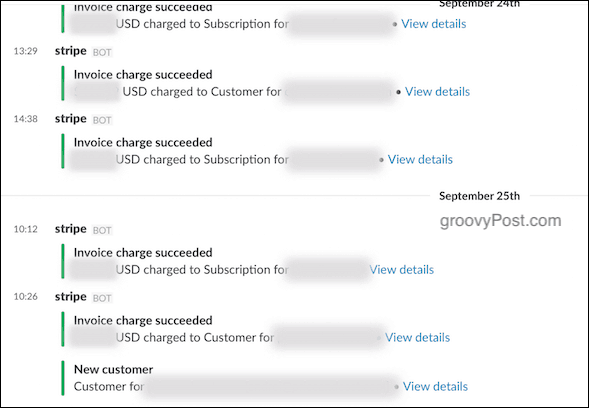 Using this integration, you can be notified when you receive money, when payments fail, when people subscribe to your service and more. Again, this stops you from having to constantly check your email or the Stripe website. Simply wait on a ping from Slack. If you have curated links and team members dropping links everywhere in Slack, the chances of an infected link is high. You don’t want to catch any nasty viruses while out on the web. That’s where Demisto steps in. It is basically an anti-virus for Slack. If a link is left in any channel that you tell Demisto to monitor, it will warn you that the link is risky and should perhaps be avoided. This is really something Slack should have built-in by default. Here are some more I like that didn’t make the final list. But it felt like a shame leaving them out. IMDb – get movie information in Slack. Or see what’s on at the movie theater. MailClark – kill the email inbox completely. Have ALL your email sent to Slack and reply to it from Slack. All your team members can see the replies though, so it might perhaps be best used instead as a support team collaboration tool. Slack Connect 4 – Play Connect 4 in your downtime. Don’t like Connect 4? How about Poker then? 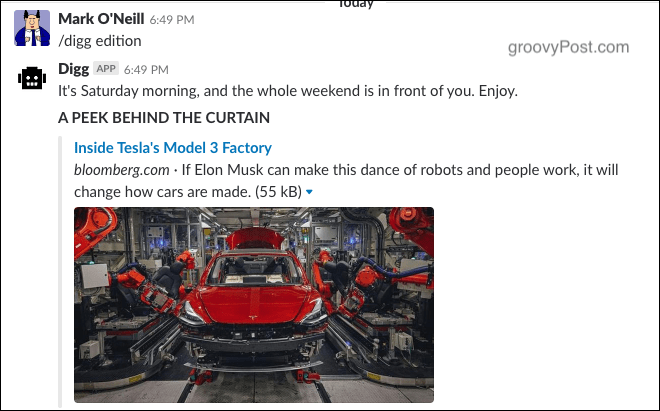 Uber on Slack – call for an Uber car in Slack. Ellie – psychotherapy is expensive, but how else am I going to deal with wanting to eat my GroovyPost boss? Instead of lying on a couch and listening to Billy Crystal for $200 a hour, you can instead talk to Ellie the slack bot for zero dollars. Just make sure it’s in a private channel, otherwise your team workers are going to find out all about your private lusts and desires. Having lots of integrations is going to make your Slack channel really busy. So I strongly recommend making separate channels for each one so your important channels are not overwhelmed with Digg links and requests to play poker. Which Slack integrations do you use to make your channels rock and roll? Let us know in the comments section and if they are good enough, I’ll write a part two to this article. Idiot question from a non-techie – Doesn’t using a VPN protect my privacy? Yes, but how does it relate to Slack integrations?